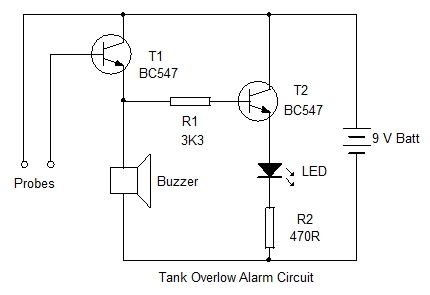 This is the simplest type of a Tank over flow Alarm circuit that can be used to prevent the overflow of water from the over head tank. Thus it prevents the wastage of water during pumping. The circuit is too simple and its cost is just Rs. 25 including the battery. Two NPN transistors are used to drive the buzzer and LED to give the overflow alarm. Two probes (two conducting pins or pads ) are fixed at the top of the tank just below the lid of tank. When the water level is below the probes, transistor T1 and T2 will be out of conduction since there is no electrical continuity between the probes. Thus T1 will be cut off due to the lack of base bias. T2 will also be off since T1 is not conducting to give base bias to T2. Buzzer connected to the emitter of T1 and the LED connected to the emitter of T2 will be of off. When the water level in the tank reaches the probes, electrical conductivity starts between the probes through water. T1 and T2 then conducts to activate the buzzer and LED. Fix the unit in the room and connect the probes with the circuit using thin wires. Probes can be two pins or two conducting pads like aluminium or copper sheets. The probes should be closely arranged with a gap of 1 cm between them.